Presently, 52 believers are attending the Sunday worship and Friday service, and 45 children attend Sunday school. Also, we started Bible training classes, which are conducted in a rented building in the evenings. We do not charge our students, and the teachers are providing good lectures without taking any pay, instead treating this as God's work. The teachers are pastor colleagues, and I have myself been taking classes. It is my opinion that we need to make our preachers and pastors more knowledgeable, and the Lord's kingdom will be made bigger through those who are studying His word today. The students who are studying at the Bible college are educated but have no money, coming from very poor families and not having jobs. 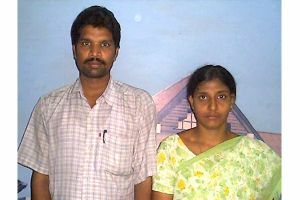 Please pray for their needs, that they will go on to be useful in the Lord's kingdom. Also, we have no sponsors or helpers for our work, and we are facing difficulty in providing Bibles, notebooks, pens and paper to our students. It is very hard to run a Bible college without that kind of support. In addition, we have 30 children who come from downtrodden communities. Some of these children are orphans or have one parent. And some parents have more than four or five children and cannot provide each child sufficient food and clothing. I have a vision to establish a children�s home with 30 children and look to our Lord Jesus to provide funds or sponsors. I have complete confidence that I can run such a home, and I think Jesus will help with it and with the Bible college. Even though I do not have sponsors or providers from abroad, I have attended between 50 and 60 open Gospel meetings, acting as an interpreter for foreigners at the request of pastors and preachers. I have been in God's service for more than a decade, meeting many people from other countries, and I have never asked for help. I believe if we are sincere in our love for Him and pray to the Lord for our needs, He will provide for us. Therefore, I have always prayed for my needs and the Bible college needs, and I've prayed about the children's home and for the ability to provide assistance to my poorer colleagues and co-pastors on a monthly basis. We are a team in proclaiming His world throughout the villages, and we are conducting open Gospel meetings, door-knock campaigns, distributing tracts and holding fasting prayer meetings for the sick and suffering as well as for the needs of the poor in our society. Whenever we go to the Gospel outreach, people invite our team to their homes to pray and to feel happy after the prayer is complete. The team is comforting many people, and some of those people say they see our Lord Jesus when they pray with us. It is really God's miracle and wonder. Hallelujah! 6. To purchase Telugu Bibles. Now I am very happy because I have shared my prayerful needs with you. "Ask and it will be given to you; seek and you will find; knock and the door will be opened to you." We pray for you and your team every day. Please remember us and our needs in your special prayers.